Recruiting has moved a long way from pen and paper format to online job boards, social media and now video interviews. The best way to showcase to potential hires that you are agile and long sighted as a company is by using modern recruiting solutions. Video Interviews are a boon for employers and candidates in multiple ways. It allows recruiters to save time, effort, and hire better talent at the click of a button and equip the candidates to find the best matched opportunity. 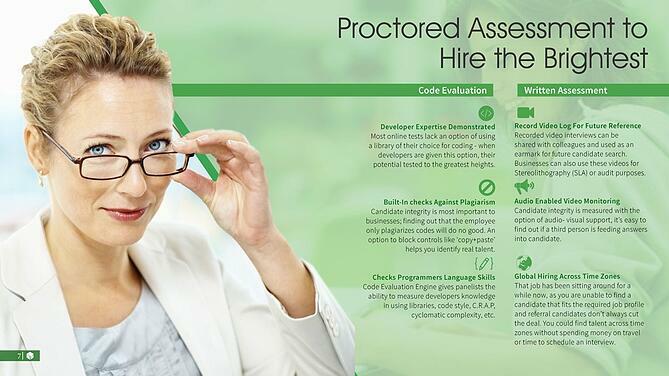 For screening candidates, options available are automated interviews, code evaluation and written assessments. 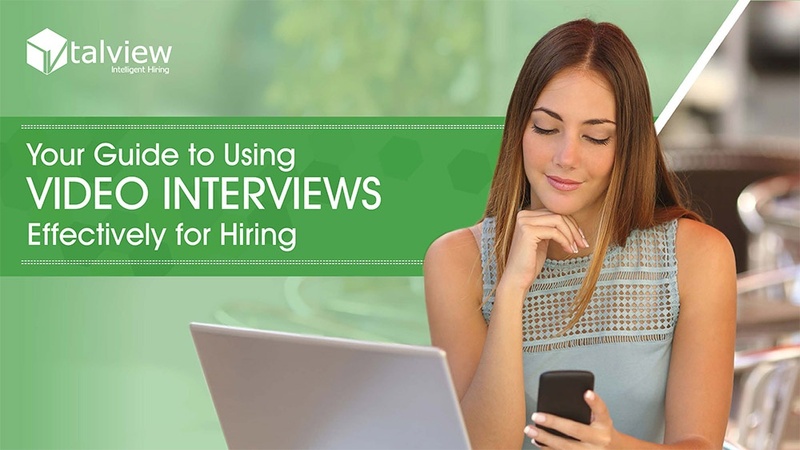 At a later stage, if the candidate matches recruiter’s requirement, they could invest time into live interviews. This works well for campus hiring, technology and sales hiring as well, where recruiters have to screen and select candidates for a handful of positions in a short span of time. In the next few pages, we will delve into the details of hiring via video interviews, written assessments, and code evaluation in the field of tech, sales and campus hiring. Most organizations have a very widespread network of salesforce. With an everexpanding consumer needs, organizations are also looking to expand in terms of salesforce. This leads to a situation where organizations put the on us of recruitment on various sales managers scattered across the country. Though this enables them to have a larger sourcing base, it also has a telling impact on quality. This approach also leads to significant increase in time-to-hire as several rounds of interview need to be conducted to put in place some control. Biases also creep in the hiring process as majority of the hiring happens through referrals which will have a direct impact on the business as a below-par field force leads to non-achievement of quotas and a smaller internal pool for succession planning for First Level Managers. In a decentralized hiring strategy, video interviews are very helpful. Not only it can lead to a significant improvement in quality of new hire, it can also reduce the time to hire drastically. Today, every company is a software company in some way or the other. Developers are the ones who are often tasked with pushing the envelope, helping you simulate, iterate and innovate faster than ever. Regardless of the industry your company is in or its size, hiring talented developers is critical for business to thrive. They are also in high demand, and not easily wooed by free passes or weekend retreats. Best tech hires are critical resources at work and do not have time, energy or flexibility to take a day’s leave and travel for an interview. They expect their prospective employers to understand that and pro-actively provide them convenience and flexibility. Written test in person reduces the candidate reach again leading to missing out good candidates, as you will be restricted by geography. A plain vanilla test is not be the best case to assess a developer’s skills, you should rather employ a code test that’s concurrent with real-life code complexity. Just technical skill evaluation does not give a full picture of the candidate even for the purpose of screening, one needs to do all round evaluation on motivation, cultural fit and suitability using tools like video interview. As employers recruiting on campus, you have a lot to work on; class schedules and part-time jobs, not to mention other employers competing for the same talent. However campus hiring teams are still very conventional and even today use pen and paper tests for the initial screening. The recruitment teams often visits the campuses or participate in career fairs, conduct paper and pen assessments for the initial screening and then spend hardly 10 minutes per candidate for face to face interview. While a lot of time goes into travel, logistics and paperwork in this conventional process there is very little time spent in evaluation of the candidate. In addition many of the students are employed either on- or off-campus or taking additional courses. This means that some students are working and studying for at least the equivalent number of hours of a full-time job, and therefore fewer students will be available to attend every career fair, information session and recruiting event on-campus. Instead, they’ll likely take their job search online when they have time around their work and studies. 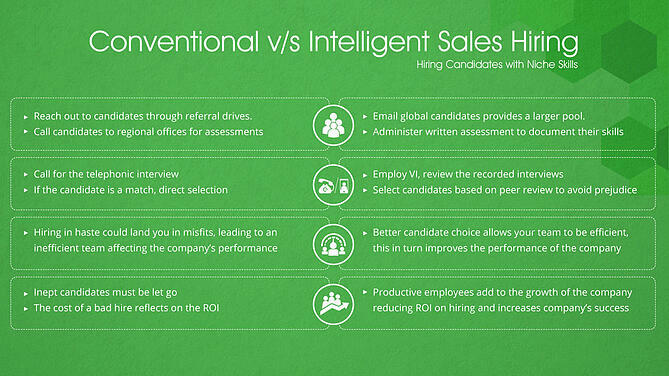 Talview has a full suite of solutions to help with each of the hiring problems mentioned above. Complete video interview suite that comprises of Asynchronous, Live, and Proctored Tests. 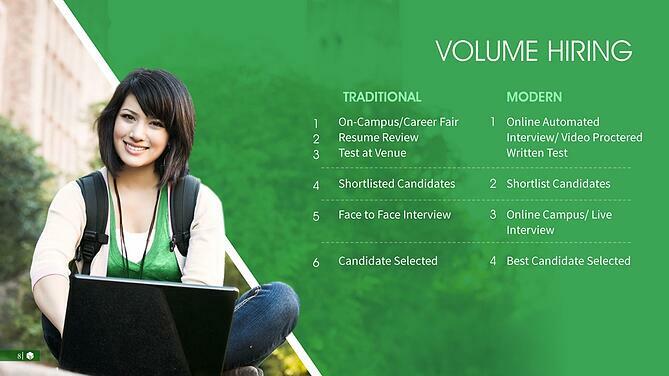 Employ MCQ/Essay/Typing Speed Tests to husk through candidates. It is the world’s first hiring tool that combines Natural Language Processing, Video Interviews, and Psycholinguistics to help companies gain competitive advantage. Ask for the recruiter-friendly hiring automation!